Provisional Tracklisting as listed on rear of original Smile Cover Art. Accompanied by the message : See Label For Correct Playing Order. Our Prayer was considered a spiritual opener for the Smile album. Now, i've grouped those tracks for a reason. On the 'Endless Harmony' soundtrack album Brian performs a solo Piano demo of 'Heroes And Villains' with Van Dyke Parks ( his lyrical collaborator for the Smile Album ) on animal noises. He performed the first part of Heroes And Villains along with sections of the rarely heard 'Barnyard' and 'I'm In Great Shape'. He described them as sections of 'Heroes And Villains'. Heroes And Villains was meant to have been released in single form containing parts one and two, combined together for the album version. Part one is possibly the version that appears on the Smiley Smile/Wild Honey twofer as a bonus track. Then again, maybe not. Part two was to have contained animals noises provided by the boys ( presumably part of 'Barnyard'? ). I'm In Great Shape not previously considered part of Heroes And Villains seems to relate to it in no way whatsoever. Having said that, I think ANYTHING was considered part of that song. Part Two has never emerged although it's rumoured Brian completed mixing on the full two part song for single release in January of 1967. Do You Dig Worms in the version heard on the Good Vibrations Box Set contains little more than 'Heroes and Villains' plus various melodic changes and vocal refrains. It's hard to believe it was anywhere near finished, maybe it was. In the context of an album, it would work, although certainly the final mixing and overdubs would have made some difference. 'The Old Master Painter' was a short instrumental leading into the Dennis Wilson sung 'My Only Sunshine'. Yes, that one! Quite charming it is too! Often placed in the middle of the Smile album on bootlegs leading into Good Vibrations it works very well. 'Wonderful' which was re-recorded for 'Smiley Smile' is much more powerful in it's 'Smile' version which basically is just Brian at the Harpsichord and beautiful singing all round. A very emotional performance, although again, it's hard to believe that a track this bare musically would not have recieved a few overdubs and special mixing effects. 'CabinEssence' is stunning and the most 'finished' sounding of the original Smile songs. Famous for Mike Love's ridicule of it's lyrics prompting Van Dyke Parks ( Smile's Lyricist! ) to promptly quit the whole operation throwing everything into immense confusion. Yeah, the lyrics may not speak to the common man or exactly MEAN anything, but they sound very beautiful to me. 'Bicyle Rider' has been considered to have been part of 'Heroes And Villains' and not a seperate song in it's own right. 'Good Vibrations' was of course finished, and dispite rumours of a six or seven minute version no evidence has emerged to support this claim. Not considered by Brian as part of Smile it would have been present for commercial reasons. 'Wind Chimes', 'Vegetables', 'Fire', and 'I Love To Say DaDa' are the best guess as to the four songs that would have made up 'The Elements' suite. 'Wind Chimes' and 'Vegatables' are listed seperately on the Smile cover art possibly due to later consideration for single release. 'Vegetables' in it's inferior 'Smiley Smile' format would indeed be released as a single. 'Child Is The Father To The Man' was brilliantly worked into 'Surfs Up' for release on 1971's 'Surfs Up' album. If the finished 1967 song was even half as good as THAT version it would have certainly heaped acclaim upon Brian and the boys. 'Surfs Up' is possibly the finest writing collaboration done for the smile project and is utterly beautiful. The first part of 'Surfs Up' had completed music written and recorded and that features on the 1971 version. The second half is accapella and it's unsure wether it was intended to be or not. Whatever, it's a beautiful wonderful song. When 'Heroes And Villains' was released as a much delayed single in it's 'Smiley Smile' format it failed to reach the top ten of Billboard. The dissapointment was everywhere and The Beach Boys never recovered as a contemporary commercial force. The Beatles 'Sgt Pepper' had stolen their thunder and the race was over. 'Holidays' and 'Look' are something of a mystery but it's possible were instrumental themes acting as linking tracks on 'Smile'. 'She's Goin Bald' was never considered to be part of 'Smile' and later emerged on 'Smiley Smile'. 'Well, You're Welcome' was issued as the B Side to the delayed 'Heroes And Villains' single that preceded 'Smiley Smile'. After Van Dykes' departure and factors including fellow Beach Boys and the record company, Brian scrapped the whole project. It was claimed he burned the tapes, although this has been disputed over the years. It's now claimed all the tapes still exist and could be edited together into a complete album. Some of the tracks however were obviously unfinished so i'm not sure if that's the case. Heroes and villains? As much time was spent recording that as the entire rest of the album put together. It still didn't come out right, because Brian wasn't concentrated enough. Still, imagine Heroes and Villains, Surfs Up, Cabinessence, Wonderful, Good Vibrations, Wind Chimes, The Elements - all on the same album? Finished?? Smile has this dark undertone, of course - a bit weird when the cover art and everything else suggests nothing but happy music should be contained inside. Smile was to have been released before Sgt Peppers. Sgt Peppers wouldn't have been as well received as it was, had smile come out when and as intended. That's for sure. It's possible The Beatles 'response' would have been seen as 'too commercial' and 'lightweight' by serious music commentators in the context of a full-blown release of Smile. When 'Surfs Up', the song, was completed in 1971 - it revealed well and truly to everyone how good Smile 'could' have been. If 'Surfs Up' had been released december 1966/january 1967 - it would have been acclaimed for what it is, one of the greatest songs of all time. Commercial success? I think Smile would have done pretty well. Top five in the US, number one in the UK and europe. 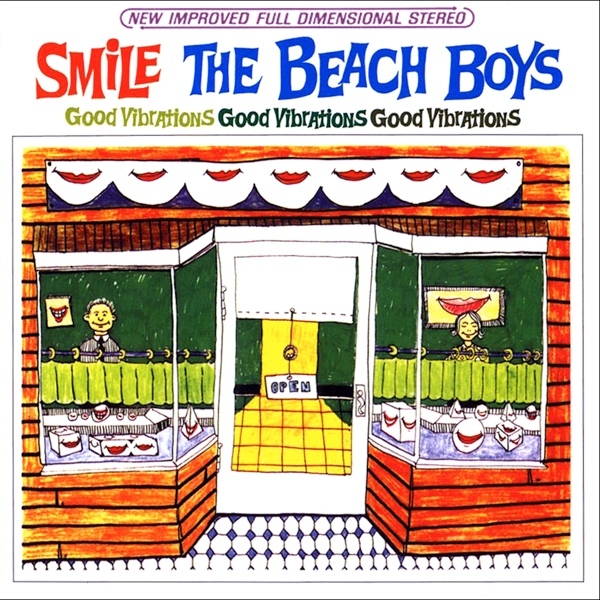 'Heroes and Villains' was never as commercial as good vibrations, but in a properly 'done' form, would have been much bigger than it's no 12 Billboard position, aka the smiley smile version! With the release of Brian Wilson's solo version of Smile and now Capitol Records 'The Smile Sessions' it's tempting to say, 'this is it, Smile is done'. Capitol's version of 'Smile' seems to follow the template laid down by Brian Wilson's version which in turn followed the template laid down by numerous bootlegs as fans tried to put together the broken fragments of the unfinished album. One thing I must state right here and now therefore is that the finished 'Smile' album would have had 11 'songs', not 18, 19 or 20. I can be sure of this as that is what the original cover art states. During the sessions for 'Our Prayer' for instance one of the band asks Brian 'is this a track?' to which he replies 'no, it's just an intro for the album'. So, we can discard 'Our Prayer' as a seperate song and deduce it would have been an intro, most likely for 'Heroes And Villains', the albums likely opening track. As for the numerous sections of 'Heroes And Villains' now assumed to have all been intended to wind up on the finished record, how so? There were also numerous discarded sections of 'Good Vibrations', for instance. So, and naturally i'm merely speculating but it's possible 'Gee' and 'Barnyard' were merely sections that may or may not have wound up on the final 'Heroes And Villains'. We know the proposed single of 'Heroes And Villains' was withdrawn in January 1967. Why? Well, Brian was still tinkering around with it, it wasn't done, he wasn't happy with the song as it stood. Interestingly 'Do You Like Worms' is listed on the original 'Smile' cover art, listed as a separate track, as is 'I'm In Great Shape'. The version of 'I'm In Great Shape' that appears on the 2011 'Smile Sessions' is twenty seven seconds long yet deserves it's own credit? And the still mysterious 'Elements', we know 'Water' and 'Fire' were the components. Some speculated 'Vegetables' was earth and 'Wind Chimes' air. People speculated it was a four part instrumental suite as well. Well, we now know thanks to Van Dyke Parks turning up in 2003 during the recording for 'Brian Wilson Presents Smile' that 'Water'/'I Love To Say DaDa' was meant to have lyrics. So, perhaps 'Elements' was just 'Fire' leading into 'Water', aka 2004's 'In Blue Hawaii'? 'The Smile Sessions' presents to us a finished version of 'Surf's Up'. It raises questions, because it's always assumed the Carl Wilson 1971 version was the only finished version, so where did part two of this 'Surfs Up' spring from, it sounds different to the 1971 version, well, the second half of it does. So, rather than putting a closure on 'Smile', that legendary lost album, this 2011 'Smile Sessions' release actually raises more questions than it answers. We know this isn't what 'Smile' would have been, or really, even close. In actuality, 'Smile' died when Van Dyke Parks was forced out/left the original recording sessions. Without the input of his lyricist, Brian tinkered away with the existing musical fragments without any real hope of being able to do his artistic vision justice.